IM GLAD WE OWN 10,000 STUFFED ANIMALS SOMY TODDLER CAN FALL - ProudMummy.com the Web's Community for Mums. 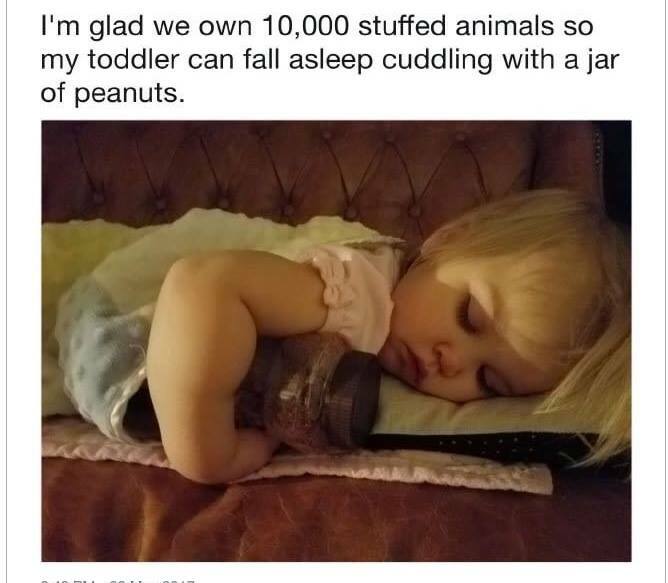 I'M GLAD WE OWN 10,000 STUFFED ANIMALS SOMY TODDLER CAN FALL ASLEEP CUDDLING WITH A JAR OF PEANUTS. My wee man is obsessed with his frying pan at the minute so is cuddled up in bed with it till he goes over then I have to steal it off him. I’ve got a little boy asleep cuddling an empty celebration tub!!!! !